We are closer to concluding this Order for Advancement series. The last tribe is the Levites who were in charge of moving and caring for the Tabernacle. They were the only tribe allowed to go near it and care for all parts of it. The Levites encamped in the center while all the other tribes encamped around them and the Tabernacle. Hmmmm…isn’t Jesus to be the center of our being and our lives while every other part of who we are is developed around Him? The answer is yes. That is the original design of God Almighty. However, we tend to develop the opposite way. We take those things around us and let them define who we are. For me personally, this has caused way too much conflict within myself and I am choosing to work continually on coming into correct order and alignment with the God-Head. As with all the other tribes, let us look at what the name Levi means in Hebrew and what His mother said to name Him as such. Genesis 25:34 – She conceived again and bore a son, and said, “Now this time my husband will become attached to me, because I have borne him three sons.” Therefore his name was called Levi. 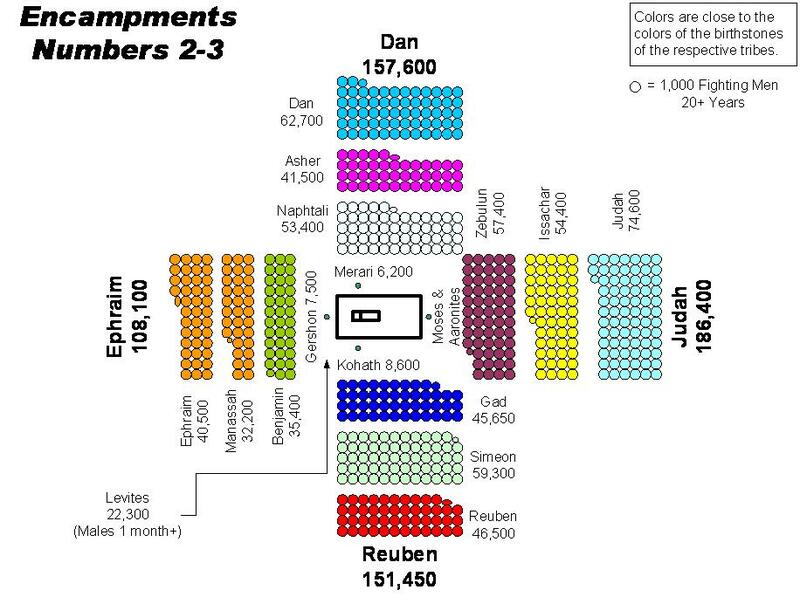 The camp of the Levites rested in the center of all other camps and broke in the middle of all other camps. The Tabernacle of Moses is a picture of Jesus Christ Himself (more on that in a future series). Ephesians 5:31-32 – “For this reason a man shall leave his father and mother and be joined to his wife, and the two shall become one flesh.” 32 This is a great mystery, but I speak concerning Christ and the church. The only point I wish for us to see here is that Jesus is our Tabernacle. He dwells within the midst of us and lives in the center of our being to those who believe just as the Tabernacle dwelt and moved in the center of the encampment. We are to be joined to Christ to become one flesh. As you study the Tabernacle you will see the tribes only moved when the Tabernacle moved which was only through the command of God. As Christ moves we are to move. He only did and does what He sees The Father doing. We are to follow the same pattern. This takes time, obedience, patience, and trust until we come to a place where we are “joined to” our Lord.